Abe Cohen Plumbing and Heating Inc. is who you need to call for residential blocked toilets in Ahuntsic, Baie D'Urfe, Beaconsfield, Bord du Lac, Cote Saint-Luc, Cote St-Luc, Dollard des Ormeaux, Dorval, Downtown, Hampstead, Ile Bizard, Lachine, Lacey Green, Lakeshore, LaSalle, Laval, Mile End, Montreal West, NDG, Nouveaux St. Laurent, Nun's Island, Old Montreal, Outremont, Pierrefonds, Plateau, Pointe Claire, Pointe St. Charles, Roxboro, Ste-Genevieve, St. Henri, Town of Mount Royal, Verdun, Ville St. Laurent, West Island, Westpark, Westmount. Stop the flow of water (see immediately below); remove spilled water and debris. 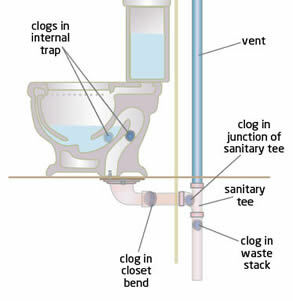 Close the shut-off valve to the toilet (look for a valve or lever near the wall, below the tank). If the toilet does not have its own shut-off valve, you may want to shut off the water to a larger area or to the entire house. You may want to consider installing a shut-off valve. Do not attempt to flush the toilet again as it may overflow onto the floor. A blocked toilet should be dealt with promptly to prevent serious damage to your property. A blocked toilet is almost always caused by an obstruction between the seat and the drain. Some things, like cotton swabs, do not belong in a toilet. Whatever the cause of the toilet blockage (in the greater Montreal area), we at Abe Cohen Plumbing and Heating Inc. are equipped to investigate and to clear the passage. We have the equipment to quickly remove the most common obstructions without damaging the toilet, fixtures, or drains. If a toilet blocks and is running, it can overflow, and property damage may occur. In the event of a blockage, the excess flow cannot escape down the drain, complicating the problem. Close the shut-off valve, and if that is not possible, disable refilling of the tank (for example, raise the float until the influx of water stops). Verifying the flush valve and replacing as needed can reduce the expense and the damage in good times and even more so in the event of a blocked (clogged) toilet. If the waterways in the bowl are blocked by minerals from hard water, it may be time to replace the toilet. At Abe Cohen Plumbing and Heating Inc., we are a three-generation family business with more than 50 years in the plumbing trade. We consider our customers to be family and friends in a long-term relationship with us. We have the experience, expertise, tools, and equipment to repair or replace a blocked toilet in the greater Montreal area. We are respectful, clean, and professional. We are certified and active members of CMMTQ (Corporation des maîtres mécaniciens en tuyauterie du Québec), ACQ (Association de la Construction du Québec), and certified partners of Gaz Métro for natural gas piping and installations.